Friday August 1, 2014, on the way to the Langhorne Reunion at the Meadows of Dan, Virginia, the sky is looking rather ominous! Forget lunch, Ali Holshouser Orcutt takes Katy out to see the “clouds” and to watch her Dad Greg and brother Liam walk right through them! Wow! This fog is thick! Will we ever get there?! Yea, we’re here, the Woodberry Inn in Meadows of Dan, Virginia, full of family from all over the coutry! Liam Orcutt is thrilled also! Evie Orcutt says “Me too!”Get me out of this car! 25 family members join the crowds at Floyd’s for a cool evening of fun and silliness! Singing, dancing, food, andd drink! What more could you ask for! What a night! Back at the Woodberry, l to r, Sarah Houchins Stuhr, Annie Holshouser, and Tyler from Mass. sing kareoke! Cousins Helen Holshouser, NC and Beverly Belcher Woody meet for the first time after becomming friends through ancestry and facebook for a year! Beverly wrote up the most wonderful self-guided tour guide to the Langhorne sites! Thank you Beverly! Pat Spangler, left, and Harvie Spangler on right tell stories and show the family where the old Langhorne Homestead was located. Cecil Youngblood, Jr.in the hat, and Harvie Spangler tell the group all about the Meadows of Dan Baptist Church being founded by Steptoe and his brother William, and in this picture flank the monument to james Steptoe Langhorne. l to r, family from Va. Calif, Ok, and NY gather for the tour of Langhorne sites. Cecil, James, Kathy, Sarah, and Roger. Sharon, Charlotte, and Roger from NY! The old Langhorne Mill site. Pat Spangler plays harmonica while Cecil and the group sing “Down by the beautiful river”! Back at the Woodberry Inn for lunch, Harvie Spangler tells stories about the families! Multitalented, Harvie on the fiddle! Those Spanglers are born with a fiddle in their arms I believe! Bernice Spangler Irvin, daughter of Dudley Spangler, brings this LP and a phonograph for us to play it on at the luncheon! Featured are Dave Pearson, John Watts “Babe” Spangler, and our own Uncle harry Houchins! Bernice brought a CD to share, and W.Wallace, Dudley’s son, brings a gift of this album to Helen! Thank you Wallace! How wonderful! Displays, books, pictures, trees abounded! 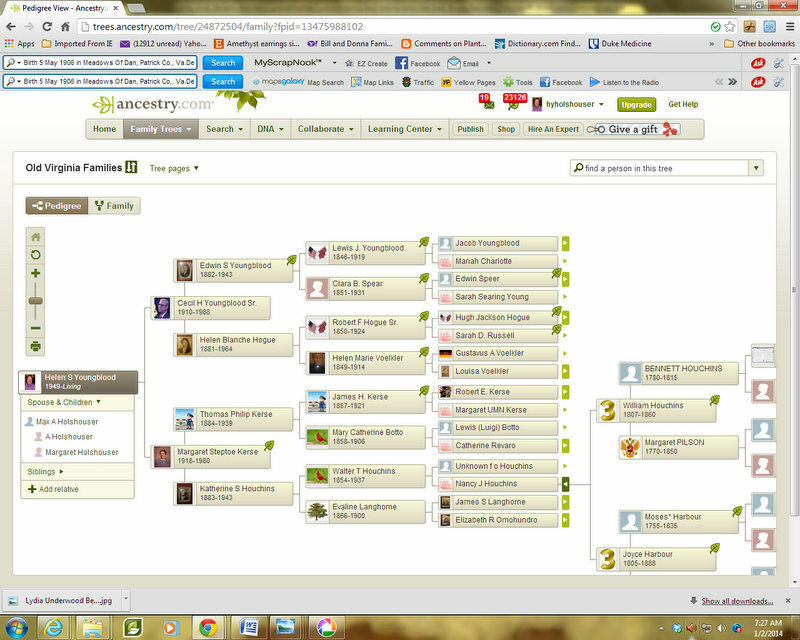 Helen and Max constructed this marvelous family tree, and lots of people brought pictures! Sunday morning, some went to church atthe Meadows of Dan Baptist Church, then joined the rest of the family already at the Crooked Road Cafe in the Cockram Mill Complex. This view shows the lovely Dan River at its headwaters.As far as the eye can see, this was land James Steptoe Langhorne and his wife Elizabeth Rachel Omohundro named the Meadows of Dan and settled on their 13,000 acre plantation named Langdale. Cousin Joey from Virginia with Liam, Katy, and Evie! Cousins leaving the Cafe, Howie from NH, Sarah from OK, Anne and Joe from Va.
Kevin! They had so much fun together! Momma Ali with three children. Howie, Mary Beth, Sarah, Fulton, and Dylan having fun at the Crooked Rd.Cafe! Katy is very interested in the ipad Helen and Susan are working on! inner workings of the Cockram Mill. Mabry Mill draws some family members as well. Some family members could hardly wait to get to see Leslie and Knightly, and shop at her wonderful store! Our cousin Melinda marshall at the winery where many of our family explored! The first weekend in August, 2014, descendants of James Steptoe Langhorne (pronounced Lang’n) and his wife Elizabeth Rachel Omohundro Langhorne gathered for their very first reunion. They came to Meadows of Dan to see the old home place, the Langhorne Mill, Langhorne School, and church founded by their 1st, 2nd, 3rd, and yes even 4th great grandparents! While some of the 50 reunioners actually live here in Patrick County and showed the others around, the large majority of the family attending were from all over the United States including California, Oklahoma, Florida, New Hampshire, Massachusetts, New York, North Carolina, and of course other areas of Virginia! They filled the Woodberry Inn, visited local sites like Mabry’s Mill, Floyd’s Country Store, and the Chateau Morrisette Winery, aa well as toured the Cockram Mills Complex with Gary and Ron Cockram along with having brunch at the lovely Crooked Road Café. They shopped their cousins’ and other’s businesses like the Greenberry House, Poor Farmer’s Market, and the candy factory. Above it all, they took in the scenery of beautiful Patrick County and the Blue Ridge Mountains! Saturday morning, the group took a tour of areas of special interest to the descendants. Thanks to permission from local land owners, and the leadership of family members Harvie and Pat Spangler, brothers, and cousin Beverly Belcher Woody who wrote up a tour guide for the family, family members got to see where the Langhornes had settled back in the 1840’s, taking over the massive 13,000 acre plantation named Langdale– inherited through their own father and grandfathers, originally part of a land grant. Grandpa Steptoe as he was called in the family, first saw the area when he was a teenager and reported it as one of the most beautiful places on earth. Because the area had some of the few flat plateaus in the geographic area on the Dan River, with beautiful meadows, James Steptoe Langhorne named the area the Meadows of Dan, according to many published articles. Steptoe went completely blind, and never actually saw his beloved home site again. Nevertheless, he married, settled here, and owned slaves who worked the agricultural part of his plantation. He established a grist mill, a school, and he and his wife and his brother William Langhorne who never married, gave land and built a log church where the current Meadows of Dan Baptist Church is located. Steptoe, his wife, his brother William, and at least three of his nine children and a couple of his grandchildren are buried at that church. Some members of the family attended services at the church Sunday morning while here for the reunion. The family was so excited, so happy to walk where their grandparents had walked, worshiped, and worked almost 175 years ago! When we ate our last meal together at The Crooked Road Café that Sunday, we were acutely aware that we were sitting on the Dan River where our grandparents’ plantation was located so long ago! We were having coffee where they might have had coffee themselves, how amazing! 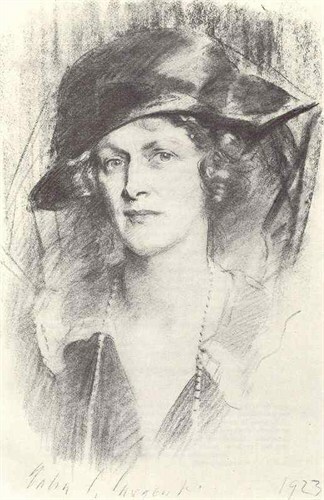 The Langhorne family is known for our most famous ancestors, and first cousins to the Patrick County Langhornes: Lady Astor, Nancy Langhorne from Danville originally, who became the first American woman to sit in England’s Parliament! At one time, she was the wealthiest woman in the world; and her sisters became the famous Gibson Girls. 1.Henry Ellis Langhorne, 1849-1865, who drowned in the mill pond at age 16. Viriginia Alice, twin of Charles, grew to marry Charles M. Cassell of Virginia Tech fame. Frances, Fannie married Wallace Wolford Spangler and had six children who became quite famous in their own right. There have been many interviews written of her son, the famous State Legislator Charles Langhorne “Tump” Spangler, and the musicians including son John Watts “Babe” who became the famous “Old Virginia Fiddler” on the radio in Richmond, Virginia. Her daughter Mary Josephine married a cousin Dudley “Babe” Spangler who was also a renowned fiddler and recording artist of the area. At the reunion, we were pleased to have Charles Langhorne “Tump” Spangler’s sons Harvie and Pat Spangler with us, as well as his granddaughter Betty Smith, daughter of Tump’s son Thomas, who told us some family stories. Dudley and Mary Josephine’s three children, William Wallace Spangler, Bernice Spangler Irvin, and Margie Spangler Cartwright were with us as well. We also had grandchildren of Lila Ann Spangler present. The Spanglers played music, directed our tours, recited original poetry of their own and their Mom’s, and enriched our experience beyond compare! Sarah Elizabeth Langhorne died at age eleven, 1857-1868. Mary Omohundro Langhorne, 1860-1952 married William Caldwell Shelor first, and Charles Davis DeHart second. She had nine children like her parents. Nancy Armistead Langhorne, 1863-1917 married William Pinkney Howell and they had seven children. Evaline, Evalyna, or Evelyn Langhorne married Walter Thomas Houchins and had seven children. She is this author’s great-great- grandmother and the reason this particular reunion was organized. 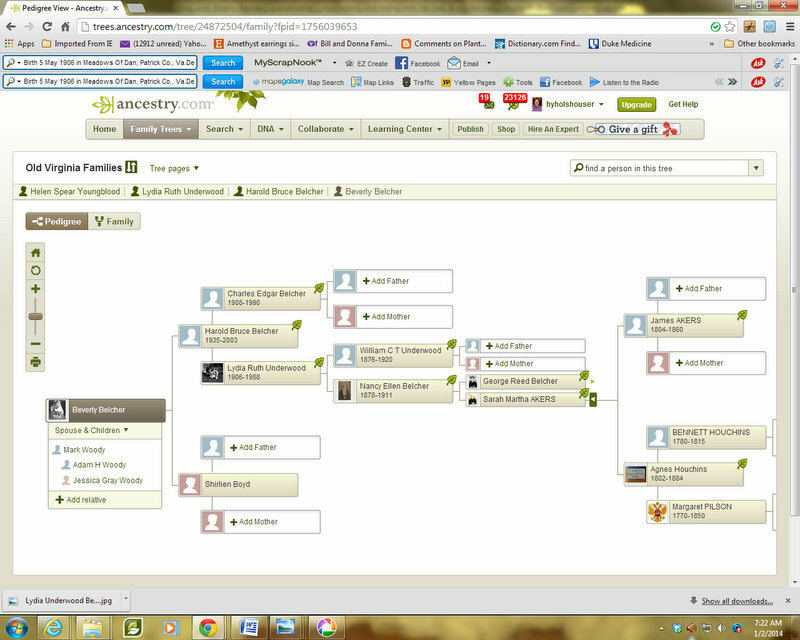 Having started researching my family tree, I studied the Langhorne family whom I had heard of my whole life, but few of whom I had ever met. My mother knew them well it seemed, but our family never took the chance to visit the Meadows of Dan. My father was in WWII, his parents lived with us, there were four children, life was busy! Suddenly, I am in my sixties and through my research I meet the Spanglers! Last year I attended their biannual reunion, and went home buzzing with the desire to introduce the rest of my mother’s family (she was one of seven herself) to the Spanglers. Not being well myself, I decided to organize a reunion of the groups I knew, the descendants of the sisters: Fannie Langhorne Spangler and Evelyn Langhorne Houchins! 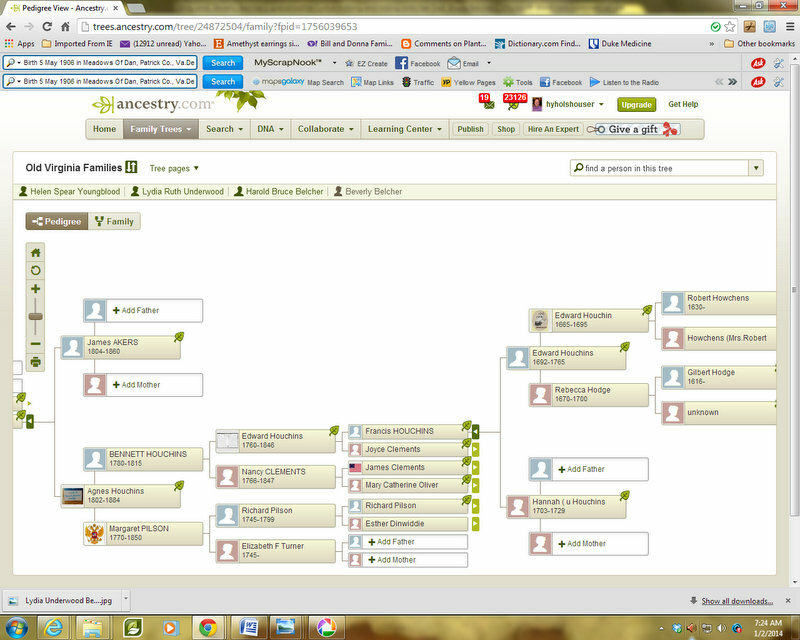 The rest is now history, but we hope to expand to include descendants of all nine Langhorne children in the future. Ernest Lindsey “Jack” Langhorne, 1879-1953, was actually Steptoe’s grandson, but was adopted by him for various reasons. He married Mary Susan Blackard and they had fourteen children! One of his great- grandsons, James Callaway Langhorne has distinguished the family by writing a book that was published this year titled The Virginia Langhornes. It is a book full of history, pictures, and genealogy! His research has proven along with some others, that the Langhornes were not from Wales afterall, but originated in England, with our first ancestors reaching Virginia in the mid 1600’s, John and Rebecca Carter Langhorne. He was planning to join us and speak with us at the reunion, but a bad bout of strep throat sadly prevented his attendance. Because the famous Langhorne/Astors, and in Patrick County the Spanglers are the family so well known, I’d like to tell you a bit about Evelyn Langhorne Houchins’ descendants. Her six living children were born and raised in Patrick County, Virginia. Unfortunately, upon the early death of their mother in 1900, they were scattered with relatives or in boarding schools across the state. Only three of the six had children. One of her daughters, Julia Elizabeth Houchins Nichols became an attorney and the first assistant District Attorney in the state of Virginia. She had a grandson, great-granddaughter, and great-great-grandson at the reunion! Her grandsons are also talented musicians as well as the greats! In the family are gifted and courageous firefighters and emergency personnel who can save your life! One son of Evelyn’s, Guy Maurice Houchins, had two children, both of whom moved to Oklahoma, with Guy Jr. becoming a Geophysical Engineer with an attorney daughter Sarah Stuhr who was present with us at the reunion! Guy’s other child, a daughter, became the famous actress, Mary Stuart Houchins (went by Mary Stuart) who played the character “Jo” or JoAnn Tate on the Soap Opera “Search for Tomorrow” which ran on CBS for 35 years! Another daughter, my grandmother kate, Katherine Steptoe Houchins Kerse (pronounced Kearse) became a nurse and raised seven children in Richmond, Virginia with her police officer husband Thomas P. Kerse. All seven of those children are now deceased, but nine of her grandchildren from all over the country attended with greats and four great-great-grandchildren present at the reunion! She would be so proud! They included Roger Buck, PhD geophysicist college professor at Columbia (Pat Spangler, grandson of Fannie Langhorne is a PhD Geophysicist Professor Emeritus from the University of Florida, and remember the Geophysicist Engineer son of Guy Houchins, grandson of Evelyn Langhorne.) Three geophysicists in one family, that’s amazing to me! There are lawyers, landscapers, computer specialists, other teachers and college professors, financial planners and several tax advisors. Contractors, musicians, realtors, and generally good people abound. I believe I counted at least six PhD’s among the Spanglers and the Houchins present from these branches of the Langhorne family! I was a family therapist by profession-every family needs one! Actually, three of us in this branch of the family taught/now teach children with emotional/behavioral disorders. There were several other teachers, and two special education supervisors in these branches. Just in case you’re wondering, just like our country, we are split politically. That might lead to lively “discussions”, but the music in our souls unites us and reminds us of our love of family. We are thankful to our homeland of Patrick County for hosting us, to the many proprietors who were especially hospitable to us like Shep and Angie Nance and Melissa Turman at the Woodberry Inn & Restaurant and many others. If you are interested in more pictures and stories of this family, you can find them on Helen Holshouser’s blog at heart2heartstories.com. Categories: Community and Family Life, Events, Festivals, and Fairs!, Langhorne Family posts, Memories, Spangler Family posts | Tags: 2014, Houchins, James Steptoe Langhorne, Langdale Plantation, Langhorne Reunion, Spangler | Permalink. On the twelfth Day of Christmas my true love gave to me, twelve drummers drumming–or…maybe you could say…twelve percussionists percussing! –or your daughter playing twelve percussion instruments, including drums! I told you we had a lively household when our girls were growing up! They sang, played several instruments each, and danced with abandon! Our house was always filled with music, and we were blessed with it! “Make a joyful noise unto the Lord”, comes to mind! By high school, Ali had been playing piano for 7 years. She knew her music well, and had been playing bells (xylophone), and marching bells in the marching band for a couple of years! By sixteen, she could play marimba, of course all the drums, snare, tympani, base, blocks, chimes, triangle, –I’m sure there must have been at least 12 instruments at times! We would watch her perform in concerts both at Enloe High School here in Raleigh, NC, and later at North Carolina State University, where she played in 3 bands and sang in 5 choral groups! LOL You could see the percussionists moving around behind the other musicians…but only us parents perhaps knew just how hard they were working…concentrating…sweating bullets to add to , not to detract from , the beautiful music! We learned a lot and enjoyed a lot! I had no idea the talents she had, and the first time I heard her play “The Flight of the Bumblebee” in concert…well, someone had to shut my mouth as it was hanging open in amazement! 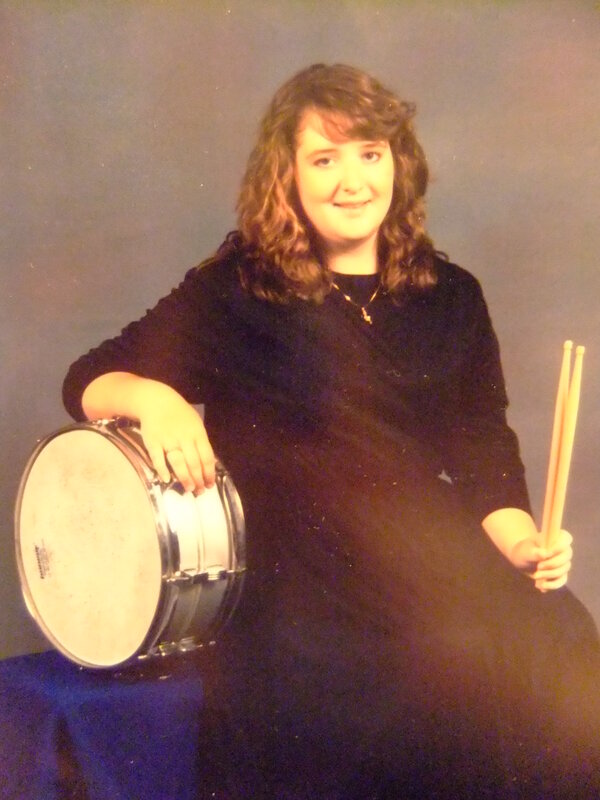 Because Ali loved percussion so…she introduced us to things like drumming circles…and the musical “Stomp!” We would never have understood this rhythm of life, this heartbeat of our souls, if we hadn’t had this player of twelve percussion instruments! Thank you Lord above for the multitude of gifts that you gave both of our daughters– talents you gave them which brought joy to us, and to many—and continue to do so! May they praise you in Jesus’s Christ’s name. Categories: Christmas, Community and Family Life, Events, Festivals, and Fairs!, Genealogy, Holshouser family posts, Orcutt Family posts | Tags: Christmas, NC State University Marching Band, Twelve Days of Christmas | Permalink. Here in Raleigh, North Carolina, USA, we have been blessed with a special group of pipers—bagpipers—for 45 years! 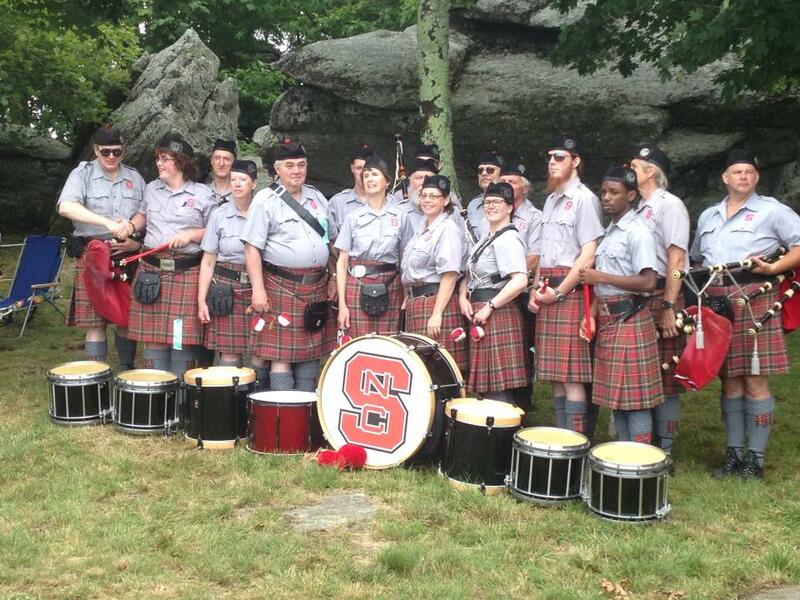 I am talking about the North Carolina State University Pipes and Drums! What a group! I have seen and heard them perform many times over the years, in fact, they performed at my daughter’s wedding reception due to her husband’s Scottish ancestry which means so much to him. My daughter Ali is friends with some members of the group, and one of my friends, and my husband’s, a friend of thirty years has played with this group for many, many years! So on this eleventh day of Christmas, as we think about the amazing talent and joy shared with us by these pipers, I wanted to tell you more about them and our friend Pete Currie. Pete and his wife Pam, and Max and I met as we strolled our children, age 2, through the same neighborhood in Raleigh! I kid you not, that’s how we met…strolling our babies…both named Annie by the way! As our children grew, we became close friends, going to the same church as well. Pete had this special talent which we were always thrilled to have the chance to witness! He played the bagpipes! I had never known a piper personally—and a nicer man, better person, you could never meet! I learned that Pete was actually born in Scotland, near Edinburgh! Even though he is an engineer by profession, I believe he was born to pipe! To this day, I remember the very first time I heard Pete play—it was at a Sunday morning worship service at our church’s family camp, in 1984! Max and I were actually in charge of the programs for the weekend long camp that year, and we had asked Pete to play, not realizing just what an extraordinary experience we had in store for our family and our whole congregation! We worshiped beside a large lake, early on a foggy, cool August Sunday morning (cool in NC August, a gift itself!) As soon as the quiet fell, Pete started to play…from far behind us….up on a rolling green hill! It inspired me then as the memory does now! He played “Amazing Grace” , and I clearly remember how the sound of the pipes rolled down that hill , surrounded and wound right through the group of us, then drifted out onto the water….it was a magical moment! It was one of those shared experiences that brings a group closer, inspires worship, and makes friendships stronger for the memory! 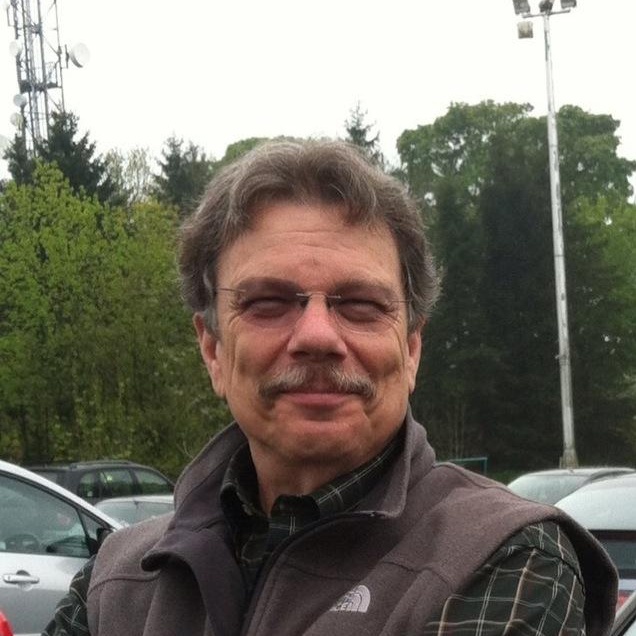 This was Peter Currie the piper, the friend, the husband, the father, the professional engineer, and good person. We count his friendship a blessing. 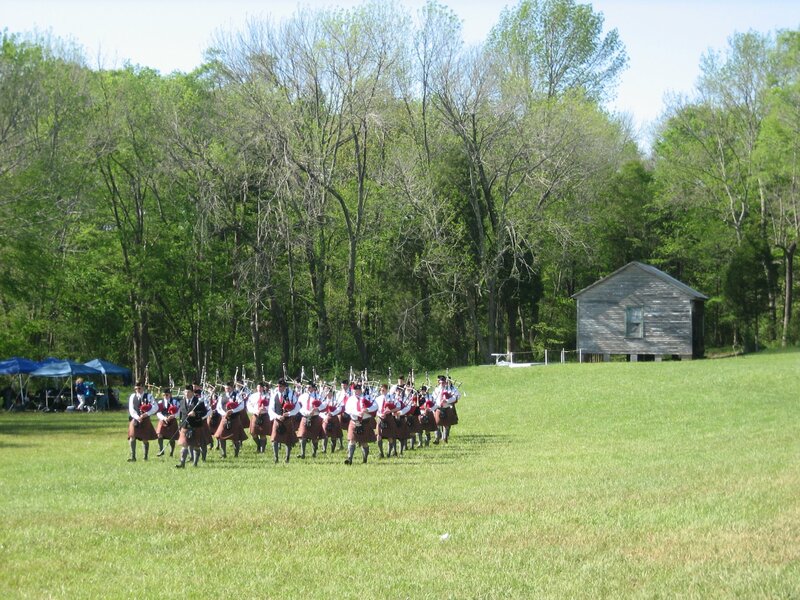 Eleven pipers piping…will always bring our friend Pete to mind, and this incredible group of pipers and drummers with the North Carolina State University Pipes and Drums! Categories: Christmas, Community and Family Life, Events, Festivals, and Fairs! | Tags: Christmas, Eleven Pipers Piping, NCSU Pipes and Drums, Twelve Days of Christmas | Permalink. 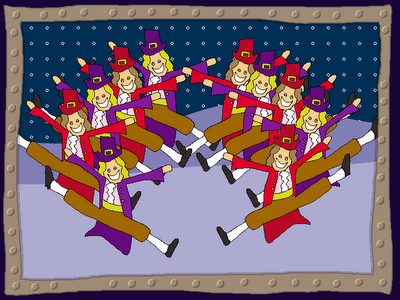 Oooh…ten gorgeous, smart and talented, aristocratic, Lords, leaping and running…brings to mind the Irish Riverdance group! Or the Bolshoi ballet, or my grandson–so proud of his running and leaping ability! “Did you see me GiGi…did you see how far I can leap!” as he sails over another mud puddle! His folks would be so proud! LOL All these thoughts run through my mind as I prepare to continue my Christmas posts inspired by The Twelve Days of Christmas. But, of course, genealogy is always at the top of my mind these days…and Lords, Lairds…I know we have more than ten in our family tree—and I’d like to share some of their stories with you! I must tell you however, that regardless of the song, Lord is not really an official title of the English peerage! This statement from Wikipedia helps explain: “Lord is used as a generic term to denote members of the peerage. Five ranks of peer exist in the United Kingdom, in descending order these are duke, marquess, earl, viscount, and baron (Wikipedia, “Lord”).” I do not care, I am so happy to present some of the Lords in my family tree to whose stories I am doing the leaping! Joy of joy, this past year I met a real live “Lord” or “Laird” with the genuine title! He is Laird Douglas Moncrieff of Glencoe! More importantly, he is one of the nicest, smartest, most talented genealogists I know! Talk about serendipity, or fate, and the life affirming pleasure of doing this genealogical research—he is not a new cousin, but he has become a friend, and a person who has volunteered his expertise to help a group of our family try to trace our Hogue family back through its origins in Scotland! We have a mystery in that line, and it will certainly take great effort it appears, to find the true line, but if anyone can help us find it, Laird of Glencoe, Douglas Moncrieff is our man! There is so much I am learning from Laird Moncrieff, who goes by Douglas by the way, and I am so impressed by him, that I want to tell you more about him in an in-depth post, unless he forbids it after this! 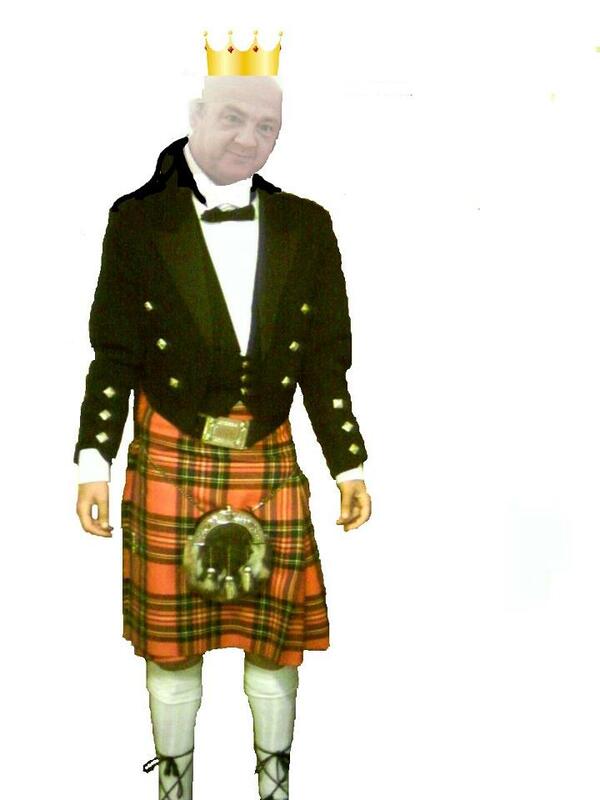 LOL Douglas lives in Scotland, is married with two sons and two grandchildren. This first Laird that I have leaped back to is a very special man, so honored to know you Douglas, to call you friend, and I thank you every day for your help! Sir Ralph de Neville, 1st Earl of Westmorland was born circa 1364 at Raby Castle, Durham, County Durham, England. He was the son of Sir John de Neville, 3rd Baron Neville and Maud de Percy. He married by contract, firstly, Lady Margaretde Stafford, daughter of Hugh de Stafford, 2nd Earl of Stafford and PhilippaBeauchamp, before 1370.2 He married Lady Margaret de Stafford, daughter of Hugh de Stafford, 2nd Earl of Stafford and Philippa Beauchamp, circa 1382 in a Stafford, Staffordshire, England marriage.4 He married, secondly, Lady Joan deBeaufort, daughter of John of Gaunt, Duke of Lancaster and Katherine Roët, before 29 November 1396 at Château de Beaufort, Meuse-et-Loire, Anjou, France. He died on 21 October 1425 at Raby Castle, Durham, County Durham, England. He was buried at Staindrop, County Durham, England. He was buried in October 1425 at Staindrop, County Durham, England. His will (dated 18 October 1424) was probated. In 1380 he took part in the Earl of Buckingham’s expedition to Brittany. 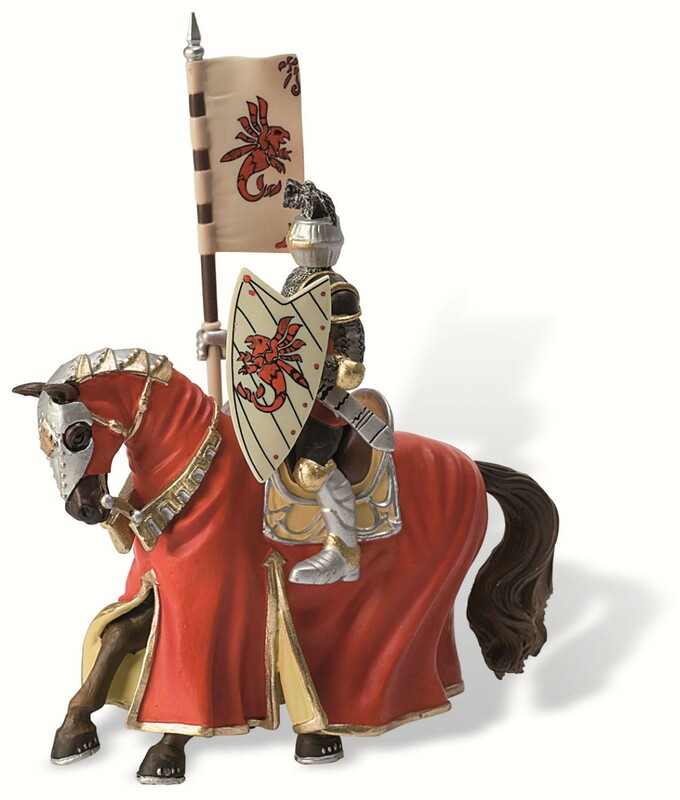 He was invested as a Knight in July 1380. He held the office of Joint Keeper of the castle and city of Carlisle on 26 October 1385. He held the office of Joint Warden of the West Marches towards Scotland on 27 March 1386. He succeeded to the title of4th Lord Neville, of Raby [E., 1295] on 17 October 1388. He held the office of Joint Surveyor of the Fortifications in the Marches on 25 October 1388. He held the office of Joint Warden of the West Marches towards Scotland in 1389. He held the office of Keeper of the Forests beyond the Trent between 1389 and 1425. He was Chief Commissioner to perform the duties of the Constable of England in 1391. He held the office of Keeper of Wark Castle between February 1396/97 and September 1398.8 He held the office of Constable of the Tower of London between 21 September 1397 and 30 October 1397. He gained the title of 1st Earl of Westmorland [England] on 29 September 1397, for loyalty to King Richard II when the later struck back at the Lords Appellant who in 1387 had engineered convictions for treason against King Richard’s friends. He held the office of Guardian of the truce in the East March on 28 November 1398. He held the office of Marshal of England between 1399 and 1413. In July 1399 when he sided with his brother-in-law, the banished Duke of Hereford, against King Richard II, after the Duke (later King Henry IV) returned to England. He was invested as a Privy Counsellor (P.C.) before 4 December 1399. He was Commissioner to treat with the Romans for the marriage of Princess Blanche on 13 February 1400/1. He held the office of Keeper of Roxburghe Castle between March 1401/2 and 1408. He was invested as a Knight, Order of the Garter (K.G.) 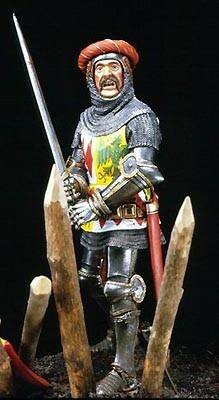 circa 1403.2 He held the office of Warden of Berwick and the Eastern March in 1403. He held the office of Warden of Carlisle and the Western March between 1403 and 1414. On 29 May 1405 at Shipton Moor, Yorkshire, England, he intercepted the rebellious Archbishop Scrope and the young Lord Mowbray, where, after a friendly conference, he arrested them in an unscrupulous manner. He was a member of the Council of Regency in 1415, during King Henry V’s absence abroad. He was a member of the Council of Regency in 1422, during the minority of King Henry VI. He was survived by most of his 23 children! He was a great church builder, ‘curious flat headed windows being peculiar to the churches on the Nevill manors’. When he died, he left money to complete the College of Staindrop which he founded near Raby, and was buried at Staindrop, where his alabaster effigy in armour between his two wives ‘remains the finest sepulchral monument in the north of England. [S6] G.E. Cokayne; with Vicary Gibbs, H.A. Doubleday, Geoffrey H. White, Duncan Warrand and Lord Howard de Walden, editors, The Complete Peerage of England, Scotland, Ireland, Great Britain and the United Kingdom, Extant, Extinct or Dormant, new ed., 13 volumes in 14 (1910-1959; reprint in 6 volumes, Gloucester, U.K.: Alan Sutton Publishing, 2000), volume XII/2, page 908. Hereinafter cited as The Complete Peerage. [S8] Charles Mosley, editor, Burke’s Peerage and Baronetage, 106th edition, 2 volumes (Crans, Switzerland: Burke’s Peerage (Genealogical Books) Ltd, 1999), volume 1, page 14. Hereinafter cited as Burke’s Peerage and Baronetage, 106th edition. [S6] Cokayne, and others, The Complete Peerage, volume XII/2, page 544. [S125] Richard Glanville-Brown, online , Richard Glanville-Brown (RR 2, Milton, Ontario, Canada), downloaded 17 August 2005. [S11] Alison Weir, Britain’s Royal Family: A Complete Genealogy (London, U.K.: The Bodley Head, 1999), page 108. Hereinafter cited as Britain’s Royal Family. [S8] Charles Mosley, Burke’s Peerage and Baronetage, 106th edition, volume 1, page 14, says 1384. 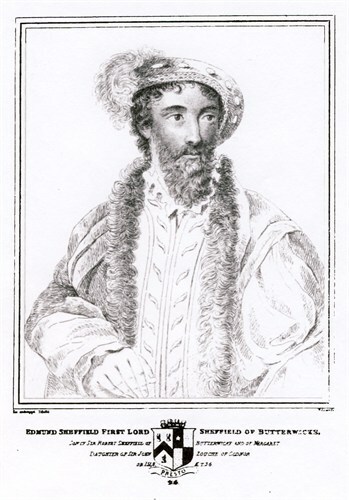 [S6] Cokayne, and others, The Complete Peerage, volume XII/2, page 545. [S6] Cokayne, and others, The Complete Peerage, volume XII/2, page 546. [S8] Charles Mosley, Burke’s Peerage and Baronetage, 106th edition, volume 1, page 15. [S6] Cokayne, and others, The Complete Peerage, volume I, page 152. [S6] Cokayne, and others, The Complete Peerage, volume IX, page 504. [S8] Charles Mosley, Burke’s Peerage and Baronetage, 106th edition, volume 1, page 17. Hunt, William (1894). 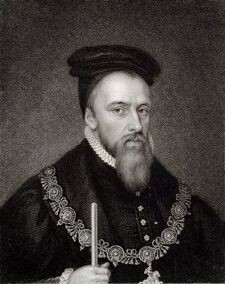 “Thomas de Montacute or Montagu, fourth Earl of Salisbury”. Dictionary of National Biography 38: 208–211. “Peter of Luxembourg (1390 – 31 August 1433) was a son of John of Luxembourg, Lord of Beauvoir, and his wife Marguerite of Enghien. His inheritance included the counties of Brienne, Conversano and Saint-Pol. Peter had succeeded his father, John of Luxembourg, Lord of Beauvoir, and mother, Marguerite of Enghien. They had co-reigned as Count and Countess of Brienne from 1394 to her death in 1397. John was a fourth-generation descendant of Waleran I of Luxembourg, Lord of Ligny, second son of Henry V of Luxembourg and Margaret of Bar. 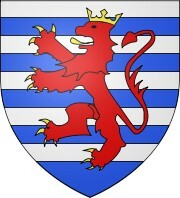 This cadet line of the House of Luxembourg reigned in Ligny-en-Barrois. This made Peter a distant cousin to John of Luxembourg, father of Charles IV, Holy Roman Emperor, and Bonne, Duchess of Normandy and Aquitaine. Peter was a sixth-generation descendant of John II, Duke of Brittany, and his wife Beatrice of England, through their daughter, Marie. Beatrice was a daughter of Henry III of England and his wife Eleanor of Provence. Henry was son of John of England and his second wife Isabella of Angoulême. Peter succeeded his aunt Jeanne of Luxembourg, Countess of Saint-Pol and Ligny, as Count of Saint-Pol in 1430. His younger brother John II of Luxembourg, Count of Ligny, an ally of the English during the Hundred Years War, received Joan of Arc as his prisoner, and subsequently sold her to the English, for 10,000 livres. Louis of Luxembourg, Count of Saint-Pol, de Brienne, de Ligny, and Conversano, Constable of France (1418 – 19 December 1475), married firstly, in 1435, Jeanne de Bar, Countess of Marle and Soissons (1415 – 14 May 1462), by whom he had issue, and from whom descended King Henry IV of France and Mary, Queen of Scots. He married secondly, Marie of Savoy (20 March 1448 – 1475), by whom he had further issue. He was beheaded in Paris in 1475 for treason against King Louis XI. Jacquetta of Luxembourg (1415/1416 – 30 May 1472), married firstly in 1433, John, Duke of Bedford, and secondly, in secret, c.1436, Richard Woodville, 1st Earl Rivers, by whom she had sixteen children, including Elizabeth Woodville, Queen consort of King Edward IV of England. Every English monarch after 1509 descended from her. Thibaud of Luxembourg, Seigneur de Fiennes, Count of Brienne, Bishop of Le Mans, (died 1 September 1477), married Philippa de Melun, by whom he had issue. Jacques of Luxembourg, Seigneur de Richebourg (died 1487), married Isabelle de Roubaix, by whom he had issue. Valeran of Luxembourg, died young. Jean of Luxembourg, died in Africa. Catherine of Luxembourg (died 1492), married Arthur III, Duke of Brittany (24 August 1393 – 26 December 1438). Isabelle of Luxembourg, Countess of Guise (died 1472), married in 1443, Charles, Count of Maine (1414–1472), by whom she had a daughter, Louise (1445–1477), who in her own turn married Jacques d’Armagnac, Duke of Nemours, by whom she had six children. The 14th and 15th centuries were well known for the Black Death, a deadly form of bubonic plague that eventually spread across the known world. Europe was badly hit by the pestilence, as a result of trading with countries with the plague; it soon grew to epidemic proportions, and would kill swiftly, and without discrimination as to gender, age or class. The plague had hit Luxembourg, France, England and Spain in the 1340s when it caused the deaths of millions of people; and it continued to re-appear at intervals over the succeeding centuries. Peter was among its victims. He died at Rambures on 31 August 1433, aged 43 years, and was buried in the abbey at Cercamp, near Frévent. His wife died 36 years later. Libro de los fechos et conquistas del principado de la Morea. 1885. 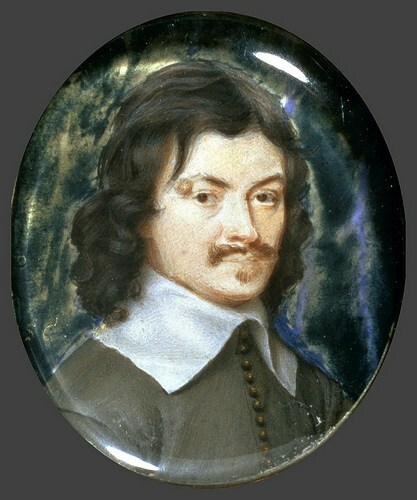 Juan Fernández de Heredia, Alfred Morel -Fatio. Imprimerie Jules -Guillaume Fick. The Chronicle of Morea. A History in political verse, relating the establishment of feudalism in Greece by the Franks in the thirteenth century. 1904. John Schmitt, PhD. Methuen & CO. 36 Essex Street, W.C. London. 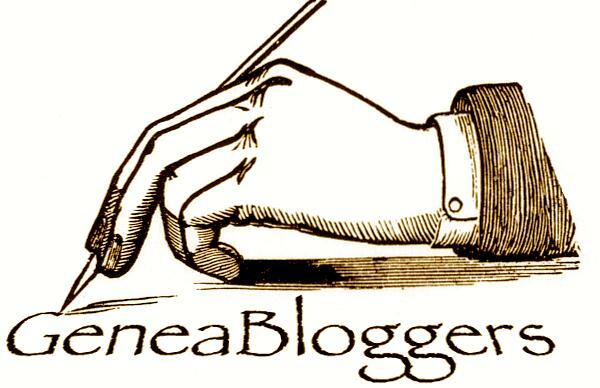 A romantic story… “William Fairfax, Sir, d. 31 Oct 1558, Steeton, England, m. 1518, Isabel Thwaits, b. 1497, England, (daughter of John Thomas and Emota (Middleton) Thwaits, Esq.). 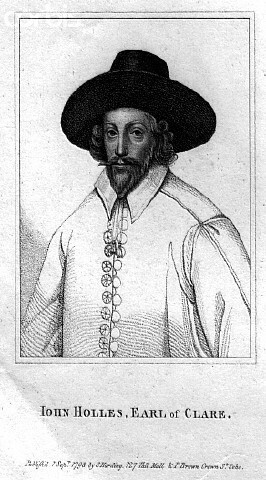 William was High Sheriff of the County of Yorkshire 1535 & 1540. He joined the Pilgrimage of Grace, 1536, but appears to have been pardoned for his share in that outbreak. He acquired the Manors of Bolton Percy and Nun Appleton in 1542 and Bilbrough in 1546. He was buried at Bolton Percy Church. Isabel was of Denton, Askwith, and Bishop Hill and Davy Hill, York. She was made an heiress by her brother, John Thwaits. Her mother was daughter and heir of Nicholas Middleton. Isabel was the ward of the abbess of Nun Appleton. Today is the 10th day of Christmas my friends and family, enjoy it, revel in it, we only celebrate such special days once a year! Wishing ou always and only the BEST! Categories: Christmas, Community and Family Life, Genealogy | Tags: Christmas, Genealogy, Lords in the Family Tree, Twelve Days of Christmas | Permalink. 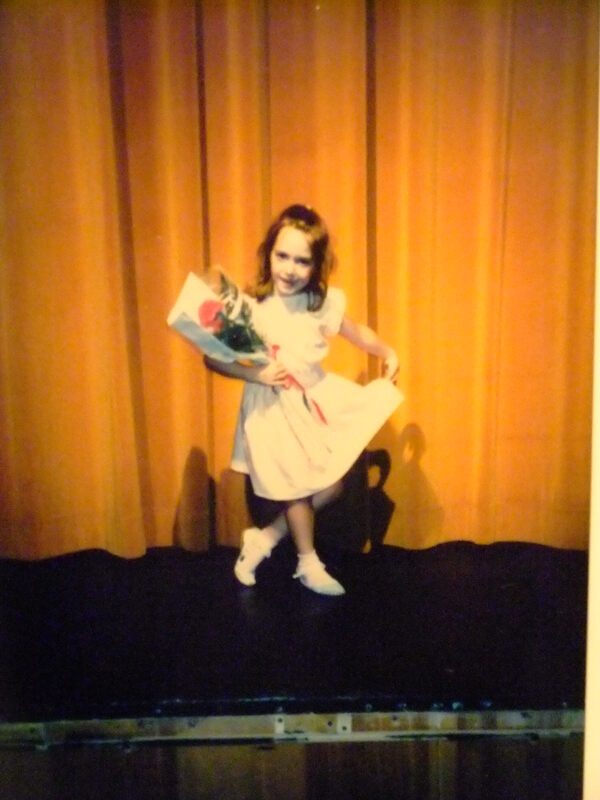 Annie Holshouser, our daughter, was our “lady dancing” all her life! She was born to move, born with rhythm, and can remember any pattern you throw at her! 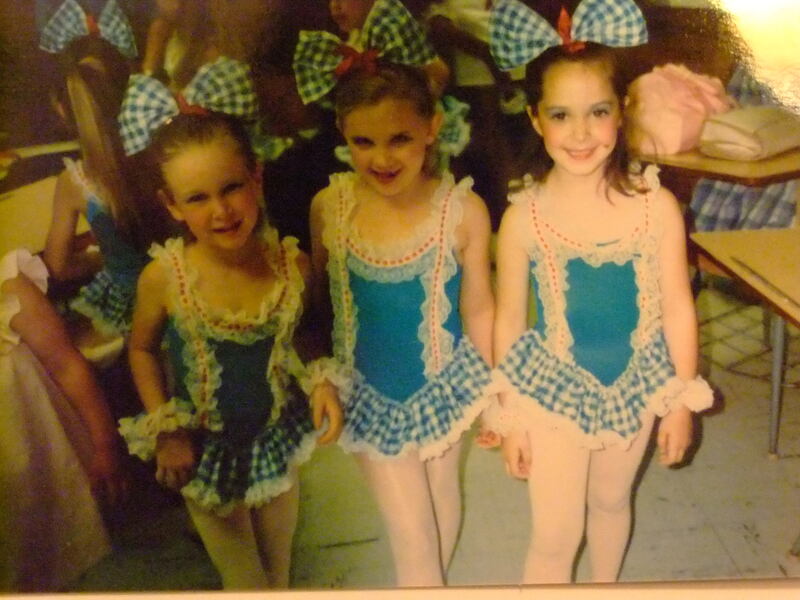 She danced from age three to …well…she still dances! I hope she always will! Max and I were blessed in that both of our daughters were musically talented in several different ways. Instrumentally, voice, dance—it allowed us to see and hear many wonderful performances over the years, from childhood recitals through college! But that Annie, she was the dancer! 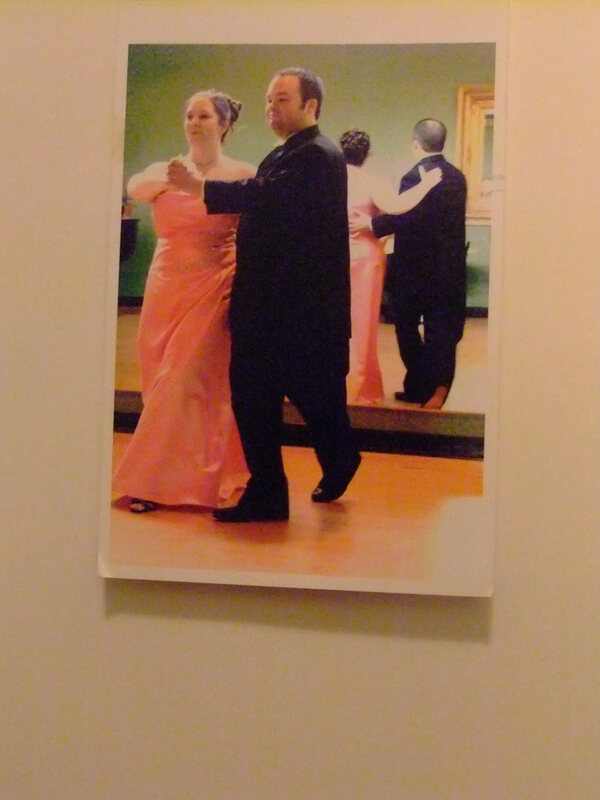 From ballet, to tap, to modern, jazz, and ballroom! You should be so lucky as to see this young lady do the tango, it was so steamy, I thought I’d have to leave the auditorium! I am her mother after all! I was never like that, so I cannot claim credit for her talent, shucks, but I can certainly enjoy it and revel in the memories. Of course, all of us parents are proud to see our kids on stage participating where their talents lead them. (or perhaps on the ball field?) and I’m sure we all have our stories, but I do remember when she was just 12 or perhaps 13, and had enrolled in her first jazz dance class . I stayed to observe, usually discouraged by Annie, LOL, but realized immediately why I probably shouldn’t have. There’s my precious, sweet, innocent little girl, right, all impulse and movement, lightening speed and grace, but what do I see? Here’s this middle-aged dancer/coach having them parade around the studio, with one huge wall mirrored, saying “Strut ladies! Strut, show what God gave you! “ You are kidding me! It was all I could do not to walk out there and jerk my child right off that dance floor! 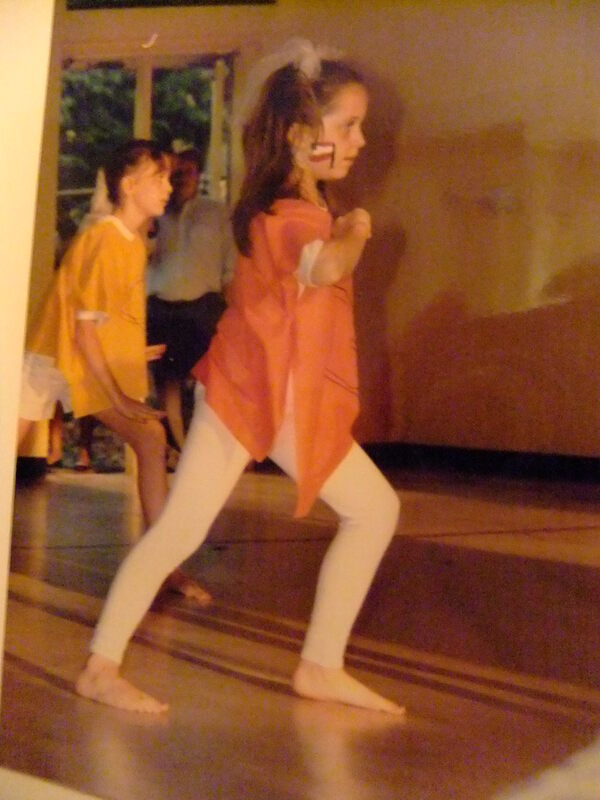 My little girl didn’t “strut”…what was wrong with her! ? LOL But I didn’t , and she survived the class only to be even more graceful! It’s hard for a momma lion to let her cubs go! 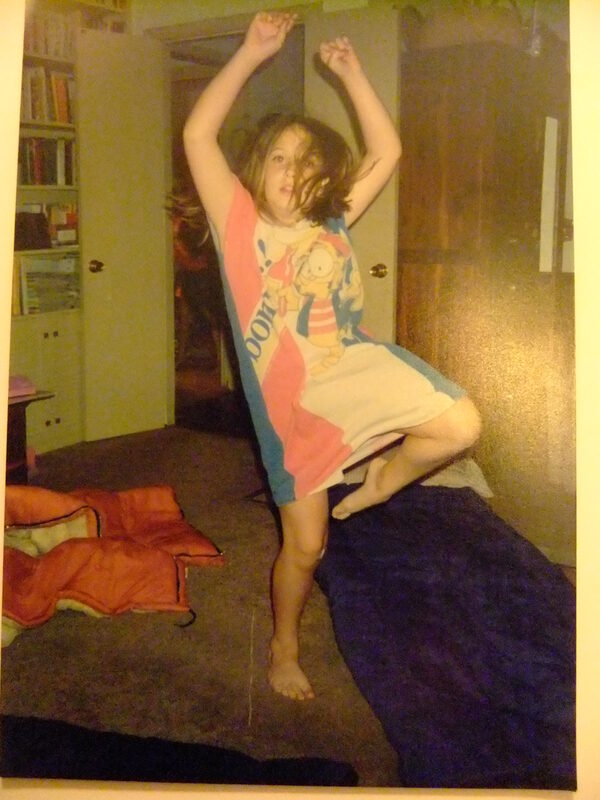 You see the picture of Annie, about age 10, “dancing like no one is watching”—in her nightgown no less! That was our life with her, from the time she was three until the present, she’s rarely far from moving to the music! 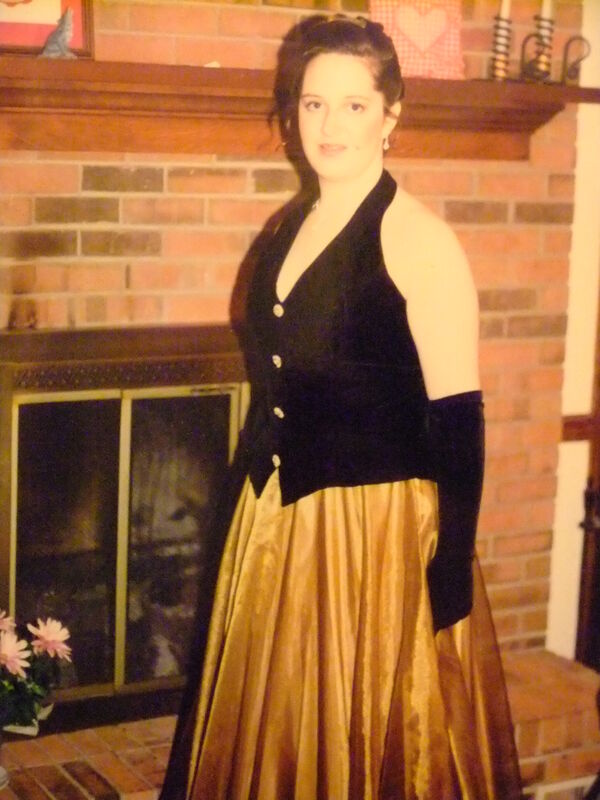 And of course , she had to grow up, moved into ballroom dancing and enjoyed her galas and balls! Keep on dancing my darling! But wait, I haven’t shown you nine ladies dancing, but hmmm…look below, you have a treat! Merry Christmas everybody, on this ninth day of Christmas, and still the beginning of a brand new year, I encourage you to go ahead and move to the music yourself! That’s right, turn it up loud, let it all hang out, smile, grin, laugh out loud! Make a joyful noise! Categories: Christmas, Community and Family Life, Genealogy, Holshouser family posts | Tags: Annie Holshouser, Christmas, Nine Ladies Dancing, Twelve Days of Christmas | Permalink. Lydia Ruth Underwood Belcher, with son, Harold Bruce Belcher, b. 1935. Beverly Belcher Woody, my fifth cousin, whom I met doing genealogical research and forged a friendship with through this work together, shared this picture of her grandmother with me, and how priceless is this! Here is a real, true “maid a milking” ! This song we sing at Christmas time, The Twelve Days of Christmas, includes this reference, because for the first time, I realize how many, millions, of young girls and women completed this daily chore as part and parcel of caring for their family! They lived on farms, and in small towns, all over the world! Among other things, the milk nourished their families physically as they nourished them emotionally. I just never thought about how many women did this task, how many started and ended their days this way—eight times 8000—our grandmothers and great grandmothers, the “maids a milking”– allowing us to grow strong and perpetuate the generations. I now know this Lydia through her granddaughter, and I know her great grandchildren! She lives in their hearts very vibrantly, touching my heart as well! Who knows where our lives will lead, and who we will touch long after we have lived on this earth. 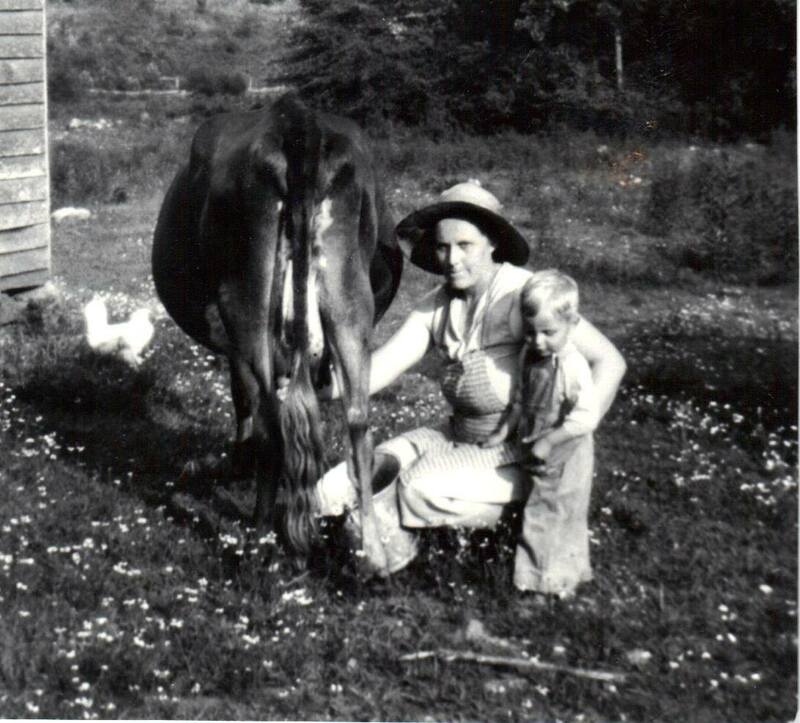 Here she is, simply going about her chores and caring for her son, and here I am inspired by her– my third cousin– for her steadfastness and her care. Here’s to you Lydia, your grandchildren do you proud by the way! Categories: Christmas, Community and Family Life, Genealogy | Tags: Christmas, Genealogy, Maids a Milking, real Women, Twelve Days of Christmas | Permalink. On the Seventh Day of Christmas my true love Max encouraged me to remember one of my proudest moments…when I could swim like a swan! I am also including a video of the Olympic Team performing their routine purely for the pleasure of watching it! I did those moves! It’s very hard for this sick lady of 64 to believe! Happy New Year my friends and family, enjoy your memories as well! Categories: Christmas, Community and Family Life, Events, Festivals, and Fairs!, Youngblood family posts | Permalink.